At Maplewood Dental Associates, we believe everyone deserves a beautiful, healthy smile – and our mission is to make that smile last a lifetime. As a premier multi-specialty dentist serving the Maplewood and St. Paul, MN area, we're proud to offer a comprehensive suite of dental treatments and services to our patients in a friendly, comfortable office environment. In addition to general and cosmetic dental treatments like fillings and teeth cleaning, we also offer treatment for the important tissue that supports the teeth: the gums. You probably already know that you need to brush and floss your teeth to prevent cavity and tooth decay – but it turns out there's another nasty condition that can endanger your teeth without proper oral hygiene. 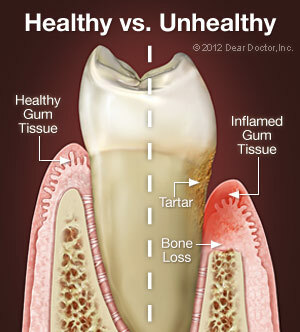 Periodontal disease, or gum disease, is a progressive condition that targets the gums. Just about anyone who doesn't maintain good daily oral hygiene will develop the first stage of periodontal disease, gingivitis. Gingivitis is generally a mild condition, but if left untreated, it can progress quickly. 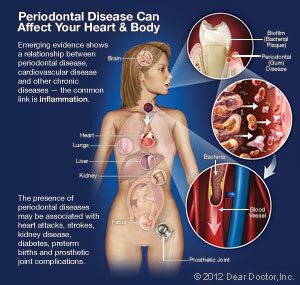 Advanced periodontal disease can cause serious problems including tooth and bone loss. Bleeding Gums: It's normal for gums to bleed when you first start flossing or if you haven't flossed for a long time, but that should fade after a few days – any other gum bleeding is a cause for concern. If your gums bleed when you brush or floss for a prolonged period, this is a major warning side. Chronic Halitosis (Bad Breath): Some forms of bad breath come from foods like garlic or onions, but if bad breath is persistent and doesn't go away, it could be a sign of gum disease. Swollen or Inflamed Gums: If your gums look red or swollen, that's often an early sign of periodontal disease. Receding Gums: Ever noticed your teeth looking longer than normal? That's not a sign of growth – it means your gums are receding, causing your teeth to appear longer because more root surface is exposed. This is a common sign of gum disease. Sensitive Teeth: When gums recede, they expose the tooth root, which isn't covered with the protective enamel that normally shields teeth. This can cause tooth sensitivity, which is another common sign of gum disease. Periodontal Abscess: Sometimes, bacteria can get trapped in a periodontal pocket (the area between the gum and the tooth). This can cause the area to swell, fill with pus, and become painful. Loose Teeth: In more severe stages of periodontal disease, the jawbone can begin to deteriorate, causing teeth to feel loose or migrate positions. This is a serious condition, and if you notice loose teeth, you should contact us immediately. Full-Mouth Debridement: This is essentially a more thorough form of teeth cleaning. We'll use a variety of specialized dental instruments to clear away plaque and bacteria, helping to clean the mouth and letting us see a clearer picture of your oral and periodontal health. Scaling: Scaling is the process of using specialized dental implements to scrape away the plaque, tartar, and bacteria that cause periodontal disease. Your dentist may use a manual handheld instrument or an ultrasonic instrument, which vibrates at a high frequency to aid in removal of plaque. In tooth scaling, your dentist will remove all decay above the surface of the gum line. Root Planing: Root planing is similar to dental scaling, but the process takes place underneath the gum line. As before, your dentist will use a manual or ultrasonic instrument to scrape away plaque and bacteria – but this time, it will happen underneath the gums, helping to reverse the effects of gingivitis and gum disease. Depending on your specific case, we may use local anesthetics or antibiotics to keep you comfortable during the procedure or kill any bacteria present on the teeth. Your dentist may combine any of these techniques to attempt to reverse gum disease, and we're proud to offer all of them in our Maplewood dental office. In some severe cases, we may need to perform periodontal surgery – and if that's the case for you, your dentist will talk with you to explain your options. 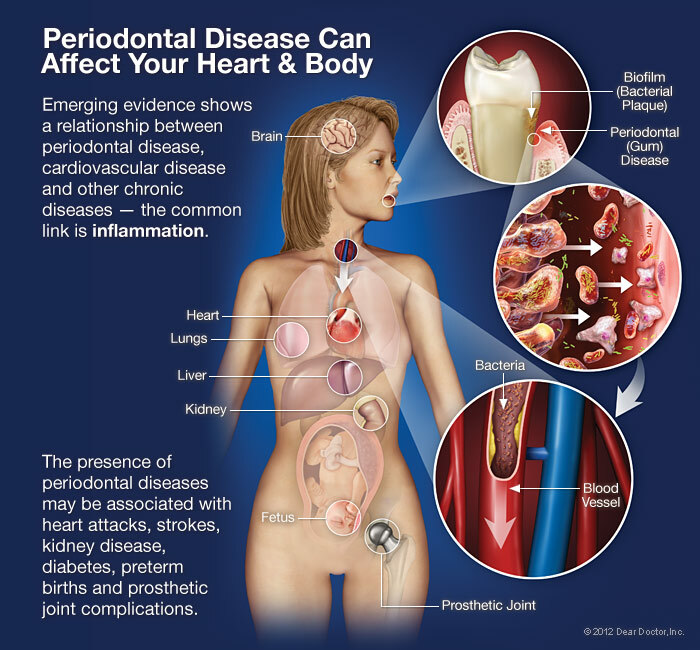 Periodontal disease is already a serious condition because it can threaten the integrity of your smile, but it's also been linked to more serious whole-body conditions like cardiovascular disease (CVD), diabetes, and even preterm birth. While scientists still don't understand why this happens, there are two main theories. One is that severe periodontal disease drives systemic (whole body) inflammation, a condition shared by all chronic inflammatory diseases. Furthermore, some of the same bacterial strains found in gum disease have also been found in the blood vessel plaque of individuals with cardiovascular disease. The exact implications of these findings still aren't understood, but it's safe to say that preventing or treating periodontal disease is vital for the health of your teeth and your body. Thankfully, preventing periodontal disease is fairly simple: just maintain a strong, diligent oral hygiene. This means you should floss daily, brush your teeth at least twice a day, and maintain regular dental checkups every 3-6 months depending on what your dentist recommends. Brushing and flossing help ward off the daily build-up of bacteria, while office checkups help us deep clean your teeth, spot periodontal and other oral diseases before they get serious, and assess the health of your jawbone through x-rays. In addition to these steps, we'd recommend maintaining a healthy diet, keeping up an exercise routine, reducing stress, and giving up bad habits like smoking. Doing this will help keep your teeth – and your whole body – healthy for a lifetime. Gum disease is a persistent danger to your teeth and gums, but with preventative care and regular checkups at our Maplewood dental office, you can keep your smile healthy for the rest of your life. Feel free to call us at 651-770-3831 if you have more questions on preventing periodontal disease, and don't hesitate to request an appointment online if you'd like to come by our office. We look forward to helping you ward off periodontal disease and protect the health of your teeth!